DIY: Chic Jewelry Holder out of a Old Window Frame! Here it is! I love it and it covers up the breaker switch box! A couple of weeks ago when Blair and I were organizing our apartment, he broke the news to me about a newfound addiction of mine. Apparently I have a lot of costume jewelry… and keeping it in a brown cardboard box was no longer appropriate. So being the awesome man and husband he is, he decided to help me out on creating a totally adorable and chic jewelry holder made out of an old window frame! Using an old window frame we had on hand (Thank you, Black family! ), an old pillow case with a rad print and some newly purchased chicken wire from Home Depot, we both finished this project with a huge smile on both of our faces. We LOVED the finished product! So I want to share it with all of you! The steps are below in a new photo format I’m trying out! *Fingers Crossed* Just click on the first photo on the left to get started! To make this Chic Jewelry Holder, follow the steps in this gallery! Click the arrow to the right for Step 1. Step 1: Lay down the window frame (no glass!) on a protected surface. Then roll out the chicken wire, place on top and with wire cutters, cut enough to leave about an inch of extra wire along the edges. *Be careful – the wire is sharp! Step 2. Place heavy objects down on the chicken wire to push it into the frame. Step 4. After stapling the wire, it’s time to get the fabric on the back. Make sure the fabric is pulled tight and that the edges are not visible from the front. *Using a clean old pillow case was the perfect amount of fabric for us! What it looked like after finishing up! Step 5. Use some twine to create a hanger! All you need to do is securely staple it onto the back – then hang! Step 6. Add your jewelry! Step 7. Step back and smile! After searching the last couple of weeks for the perfect Valentine’s Day card for Blair, I gave up. I couldn’t find one… I know there are tons of cards out there, but most of them are too cheesy or just dumb, so I decided to make one myself. A blank white card with an envelope *You can buy a pack of them at Walmart. Images of a Mickey Mouse silhouette and a Minnie Mouse bow *I used simple ones I found off of Google – You’re just tracing the basic shape so they don’t need to look wonderful. Outline the bow shape with a Sharpie *Time to get creative! My bow is far from perfect, but I looked at a few bows online and just mimicked the outlines I saw. Put your special message inside the card. Just make sure it is something from the heart! After finishing this project, I literally got butterflies in my stomach. It makes me beyond happy and I’m so excited to watch Blair open the envelope and see this. I know he’ll LOVE it and I can’t wait to give it to him! Since my original plan of doing a sewing project was thrown out the window practically within 30 minutes of waking up, I knew I needed to get my mind off what it was worrying about. That’s when it hit me what I wanted to do. I wanted to add a felt heart to my makeup bag. A while back I had pinned something just like this from Etsy. It’s simply adorable and I’ve wanted it for quite a while now – so last night I just decided to make it myself. To begin I just grabbed my makeup bag . It’s big, waterproof, lined and has an outside pocket (perfect to store all of my brushes). It’s actually a toiletry bag from an Army supply store called Ranger Joe’s, but it is by far the most perfect bag to use for makeup – I love it! This is by far one of the easiest and quickest projects an Army wife can do to spruce up anything digicam. Knot the thread and take a step back to admire your adorable Felt Heart ACU Makeup Bag! Left Bag: Etsy makeup bag for $25. Right: Ranger Joe’s toiletry bag for $12.99. *Just add a DIY felt heart with embroidery thread yourself and save over $10. Since moving to Washington, I’ve realized that most people up here consider 50 degrees outside to be practically summer. I never understood this until recently though when the clouds split, the sun came out and the air was crisp, yet warm. It was an absolutely beautiful day and the perfect temperature to go hiking. While I ended up staying inside doing some much needed laundry, I decided that next time the sun came out and the weather was nice that I would be prepared. So that next weekend, Blair and I made some pace counters for us to use when we do decide to go out on a hike. To Army guys, pace counters are also known as Ranger Beads. When going out on their 4+ kilometer ruck marches, Ranger Beads help them keep track of how far they have gone and how much farther they may have to go. At a Army surplus store, these little guys can cost up to $13, where as this DIY comes out to be about $1 a piece. Talk about a bargain, right?! The quick explanation on how to use a pace counter goes like this: There are 1000 meters to every kilometer – so every 100 meters you walk you would slide a meter bead down to the bottom. When you get to the point that you would slide the “10th bead” down, you have gone a kilometer! So go ahead and slide 1 kilometer bead down, and reset your meter beads back to the top. *While dependent on the length of your stride, my husband and his buddies average about 65 steps per 100 meters (1 meter bead). **There IS NOT a 10th meter bead! But when it is time to pull that “10th bead” down, you are going to pull a kilometer bead down. So, 10th bead = 1 kilometer bead! After folding a 25 inch piece of 550 chord in fold in half, make a knot about an inch down. *This will make the loop for you to be able to hang it on belt loops or ruck sacks. Step 1.Then take the ends and cut them at a narrow angle. You’ll want to carefully reconnect the loose strings of each end by warming it with a lighter and pressing it firmly together with your fingers. *TIP: Make sure to not cut too much away from the ends – you’ll need all of the chord! Step 2. Add the 4 kilometer beads and knot the section off. Leave enough space to slide the beads up and down and to be able to tell which ones you have slid down already! *TIP: Use the tweezers to pull the chord ends through the bead. Step 3. Add the 9 meter beads. Again, leave space to be able to slide them up and down. Then finalize the whole thing off with the last knot. *TIP: Sway the lighter under each knot as you go to tighten the knot. Since the 550 chord shrinks under heat, this will prevent the knots from ever moving! This is one of those DIY’s that the second one is always better, so don’t worry if the first one isn’t perfect. With the cost of all the supplies being so cheap, practicing on the first one won’t make you bankrupt! I’m excited to make some for myself that aren’t so Army-ish – maybe a pink one or something like that. But in the end all I can say is that I’m really looking forward to the sun coming out one of these weekends so I can try this little guy out with Blair on one of the many Washington hiking trails nearby! *This post was influenced by Army Ranger Beads on instructables.com. Seeing as how Blair had staff duty (a 24 hour shift) yesterday, I had prepared a huge To Do list of things to accomplish. I wanted to get a blog post up, deep scrub the bathroom, reorganize our bedroom closet, maybe take Costello for a walk and get our taxes done. Since I’ve had busier days before, I thought I would be able to pound these things out without a doubt. However, as the day quickly came to an end, I found myself hitting my head against our dining room table out of frustration. TurboTax Military Edition is free for E1-E5’s! The day had practically gone as planned until I sat down to do our taxes. Now I’m not too sure if this is embarrassing for me to say or not, but this was my first time actually filing taxes. Before I had always been claimed as a dependent or asked my Dad to file my taxes for me (BTW, thanks Dad!). I had not only watched him file taxes before, but also several other family members – and every time it seemed to be just as easy as “1 – 2 – 3”. I’m not a number kind of person, but I figured that all I was essentially doing was “copy and pasting”. However, I didn’t take into account how much filing as a newly married military couple would confuse me – and it did just that and more. Again, embarrassingly, I felt like I was having a complete mental breakdown all thanks to filing taxes. To give you a little bit more background info, I was using TurboTax’s Free Military Edition for (ranks) E-1 to E-5. After doing a little research, I found that there were several different places that would do our taxes for free or had a free diy tax filing program. At Fort Lewis, there is the Tax Center or the H&R Block At Home Online tax preparation is available too, but I found that most people find TurboTax’s edition to be better when it came to getting more tax refunds. And, hey, who doesn’t like more money?! But here are some Important Things to Know Before Filing Your Military Taxes! 1. Know your Home of Record. In our case, it is actually Blair’s Home of Record because he is the active duty enlisted one. Typically, the Home of Record is going to be the state you lived in when you joined the military – a.k.a. state of residency. So despite currently living in Washington, Nevada is his Home of Record. *If you aren’t sure, check his LES (Leave and Earning’s Statement) through mypay.gov. 2. Understand and decide whether you will use the Military Spouses Residency Relief Act. This relief act allows military spouses to claim their active duty spouse’s state of residency even if you have PCSed to another state. For me it made sense to keep my residency in Nevada – state taxes are considerably lower there! 3. Make sure you are keeping track of what you can write off! While many of the tax write offs out there for military service members, veterans and their families may not apply to your life, sometimes they do! So always make sure to do your research to see what is out there! Currently there are tax write offs associated with PCSing costs, uniform costs and more. *So, Army wives, start keeping all of your receipts associated with any personal military spending right now!!! Next year you’ll be able to add up what you spent out of pocket for things like uniforms. Just make sure you don’t include the uniforms they buy using their annual uniform allowance! 4. Take advantage of the free tax programs out there. Even though I had a difficult time doing ours to begin with, as long as you know and understand terms such as Home of Record and Military Spouses Residency Relief Act, you are set. Why pay when something free is available to you, right? *Just so you know, your employer actually has till the end of January to send out W-2’s! Also, 2013’s Tax Deadline is Monday, April 15th! Despite not clicking the send button on our taxes yet, I still found myself having a productive day, even after all of the frustration and stressing. 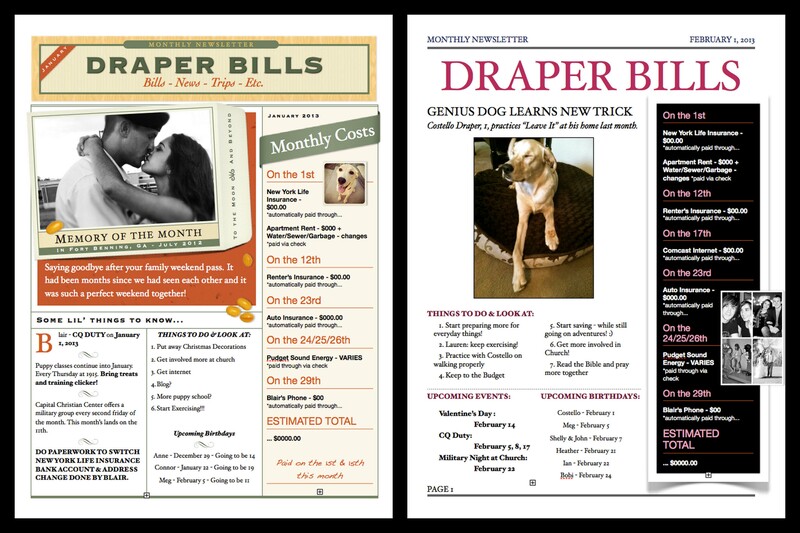 And to calm myself down after this fiasco, I got a little crafty/organizational and created February’s Draper Family Newsletter. Now it may seem cheesy, but it is oh so helpful for me – and it was the perfect way to end my day filled with taxes! Our January and February Newsletter. I use templates in Apple’s Pages program to create these! Molly and I at my wedding. I honestly don’t know what I would have done without her! Seize the day. A while back I headed over to hang out with one of my best friends. Now Molly isn’t any typical best friend – she might as well be my sister and, in fact, I consider her just that. She’s always up for anything. Want to drive? She’s down. Go get fries and a chocolate shake? She’s in her old truck before I know it. Do something crafty with me? She is always there to be my helping hand. So this day was special. It was beautiful outside; the corn field was bright green with new growth and the sky had the most perfect clouds floating around it. I was instantly inspired and wanted to make something to remember the day – or rather seize the day. So Molly and I decided to make a burlap banner. While those are pretty popular right now, ours ending up being a little different (Just like us. 😉 ) We didn’t want straight perfect edges or the seam of the burlap flags to fold perfectly over the twine. We wanted it to be bold, crisp and bright. Before getting started, take your burlap, trace your flag stencil onto it and cut out your flags! 1. Print out your letters in the font you want and in a size that will fit perfectly in the middle of the burlap flag. 2. With a ruler, take a piece of parchment paper and divide it into even cube sections by drawing lines, then lay a letter underneath a section and trace. 3. Cut the cube sections to separate them, then use an Exacto knife to cut out the inside of the letter – this will then become your stencil. 4. Using tape along with a firm hand, hold the stencil down on a flag and dab your foam brush with paint onto the burlap. I placed mine on top of cardboard so I wouldn’t get paint on the countertop. *It is important to make sure a letter’s placement on the flag is centered otherwise it might end up being crooked. Also, do not do a sweeping motion with the foam brush on the burlap! The texture along with a dabbing motion is the key to a perfectly stenciled letter. 5. Let the flags dry long enough for the paint to dry stiffly. 6. Lay the flags out in the order you want them in. 7. One by one, add a strip of hot glue to the back of the flag (an inch or so off of the top edge) then attach the twine. *Make sure to leave enough twine at the end to be able to hang it up! And here it is – the Final Product! Just remember to have fun and not stress about it being perfect. After all, it’s homemade – not a cookie cutter buy from the store!